"Product discoloration due to blade contact is eliminated with KASCO SharpTech fish cutting blades." At KASCO, we have combined our oxidation free cutting surfaces with a light tooth set to create the clean quick fish cutting blades that minimize product waste. Product discoloration due to blade contact is eliminated with KASCO fish cutting blades. The cutting surfaces of our blades are hardened without producing oxidized surfaces. The bright, oxidation free blade creates a clean cut that doesn't leave discoloration behind. Our enhanced manufacturing process results in durable and reliable fish cutting blades. Optimized tooth grinding, tight set tolerance, finely controlled impulse tooth hardening, and quality inspected welding yields the sharp, reliable, and long-lasting fish cutting blades customers come to expect. KASCO fish cutting blades are designed to maximize cutting efficiency and minimize product waste. KASCO fish band saws are available in a variety of product configurations. Whether your fish processing needs are portion control or more demanding high volume cutting, KASCO has the fish band saw for you. We are the premier supplier of band saw blades in the fish processing industry. Engineered to enhance precision and stay sharp longer, it's easy to see why KASCO fish cutting blades are the best catch in the fish processing industry. KASCO also offers a variety of machine service, maintenance programs, and cutting supplies. We have over 110 years of experience with supplying our customers with innovative and world-class fish cutting blades. The KASCO .014" thick band is ideal for reducing waste while cutting. 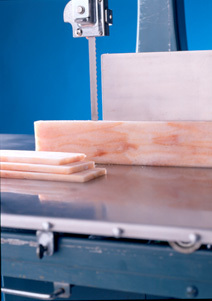 The band blade is designed for high-speed saws, frozen fish blocks, and other boneless products. All KASCO band blades are engineered for durability and precision slicing. For a slightly thicker version of the 5/8" .014", this .016" blade slices quickly and cleanly with minimum waste. The band blade is designed for frozen fish blocks, boneless products, and light bone-in portion control cutting. All KASCO band blades are designed for reliability and accurate slicing.